November /09 Scraptivity kit. I loved how this one came together. 7 Gypsies dp and ephedemra, Core'dinations cs, S! 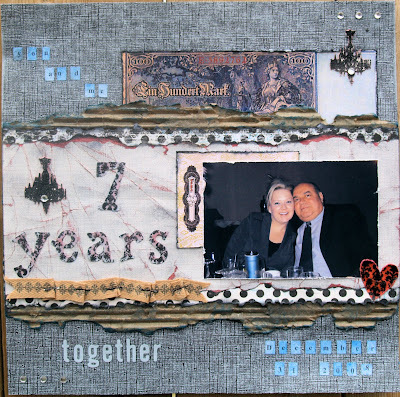 cardboard box, Prima stamps and bling, Sizzix alpha dies, Prima ribbon, staples, Crackle Accents, Glimmer Mist Memento Ink, Versamark, Black Soot Distress ink and embossing powder and Versa Color ink. You really stretched that kit out to soooo many projects. I can't get enough of your artist tray, and the ATC is so cute as well! I really love this LO, I think it's my fave of the ones you did with the November Scraptivity kit! Love the vintagey/edgy colors and look to this, super cool!!! !